Really knock their socks off with this rich and colourful blend of beautifully arranged stunning Oriental Lilies, Tulips, Carnations and Gerberas plus a variety of green foliage. Majestic is guaranteed to win over even the toughest of critics. Buy this arrangement for someone today or order it to be sent home, as the finishing touch to an interior decoration project or for a function, because....it's Majestic.Lilies may be sent closed/partially closed in order to prevent damage and to last longerTo better personalize your gift, you can choose a bottle of wine to complement your order. For Majestic, we recommend a classic bottle of Moet and Chandon. 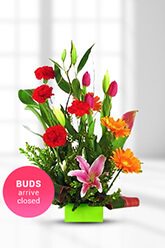 Needed flowers delivered in Australia and I'm in the U.S. Found this website and the flowers were delivered exactly when promised and they were beautiful. Happy Mom is a good thing! I didn't realise l had this email so have sent a separate email to zflowers. Great to receive a Yearly reminder on a special date. Great to know the delivery than is always on time. Great service to recommend! You managed to deliver same day. Thank you. My sister loved the balloon.